Kitchen: 638 2nd St., Oakland. Kiosk: 334 Frank H. Ogawa Plaza, downtown Oakland. 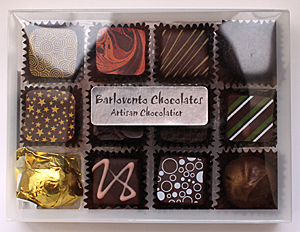 Barlovento Chocolates, founded in 2008 by Peter Brydon, a chocolatier who has been a mentor to a lot of other local chocolatiers. Barlovento has a kiosk in Frank Ogawa Plaza in downtown Oakland. You can find their bars in some shops around the area. Their kitchen is also open sometimes for direct sales. Check their website for more information. A Barlovento box full of flavor explosions.